Anyway, it was great to be away from work and normal life for a bit. I spent a good portion of my time reading and catching up with friends but I was lucky to be with a group of people who like to work out (almost) as much as I do. We also happened to be staying at a beautiful place with plenty of things to do to keep active, and lucked out with some awesome weather. As I’ve mentioned before I don’t like to use my vacations as break from exercise and always do try to get in some type of a workout or sweat even though it might not look like a typical week in the gym. Here is a weekly rundown of the workouts we managed to sneak in! We also got in about 45 minutes of canoeing on the lake. Stayed at a hotel this night. There was no gym so I looked at a map and headed out for a run. Not really sure how much ground I covered but ran for about 35 minutes. I found a park on the route so I stopped to get in 30 pull-ups. I usually try to break-up a large chunk of pull-ups like this by doing sets of max reps until I hit my target number. Rest in between each set. For example: 8,6,5,5,4,3… you get the picture. We actually managed to get in a final round of ab-targeting exercises. 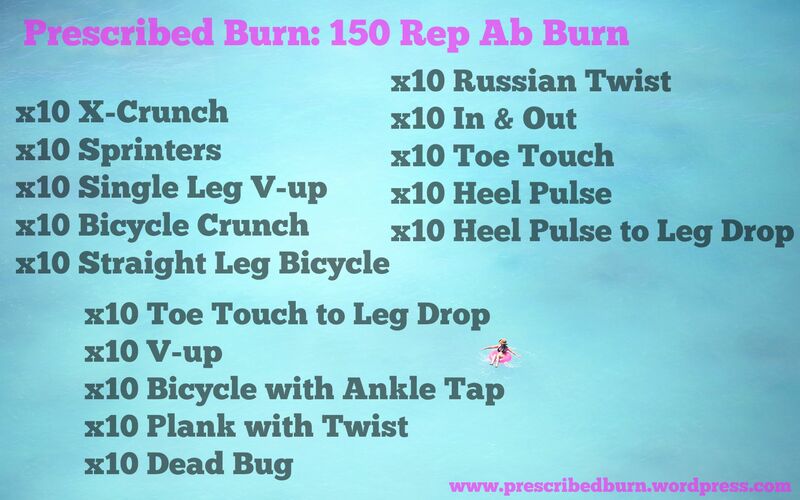 I lead the group through this great burn-out ab set I often do at home. Give it a try! We spent the rest of the day on the lake! I brushed up on my rusty wakeboarding skills. I took myself through a workout this day. Again, I started with another 2.5 mile run and then completed a TABATA style workout similar to this one. I also got in some slalom water skiing later. I never fail to be amazed at how tiring it is to ski! I can always feel it in every tiny little muscle I don’t normally hit in the gym. We had a day of beach volleyball planned so we went light on legs. This workout was also deceivingly hard. It’s a chipper style workout – you work your way through all the reps for each exercise by chipping away in whatever order or variation you choose. This is a workout you could easily adapt to do ANYWHERE. If you wanted to make it completely equipment free, sub tricep dips for the band rows. We forgot to set a timer but probably finished in just under half an hour. I was definitely tired but had enough left in me for a couple hours of beach volleyball, which I LOVE. No formal workout today – we did Via Ferrata. Via Ferrata is a form of clipped-in rock climbing, using cables handles and beams to scale to the peak. There are Via Ferrata courses all over the world. Check out more on the one we did here. Leaving the campsite earlier in the week we saw some ants (people) high up on a rock face, climbing to the peak and decided we had to do it. I’m so glad we actually got it in before our vacation ended, it was amazing! I now have the itch to try courses in other parks/states/countries. The entire course, all the way up and back down took around 5 hours. We did get a couple 10 minute breaks for snacks and water but it was definitely a great workout. Between the upper body strength for climbing and hiking both up & downhill, I was exhausted by the end. Our final day away, which was actually a travel day. I was happy to get moving before spending most of the day in the car. We were at another hotel with no gym so I went on a 30 minute run around the hotel and then completed the ab burner I posted above. I had a wonderful vacation! It felt great to stay active while away but it was even better to spend the entire week having fun and relaxing with friends.